The first match of the current tour of South Africa by the School Sports Australia team was played today. The School Sports Australia team is an Under 15 representative school team, selected from the best players in the School Sport Australia carnival held in Darwin in August 2013. 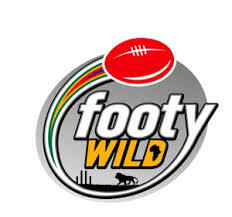 The AFL Community – Schools website stated that the School Sport Australia National Australian Football Secretary, Mr Luke Soulos, has confirmed through correspondence to AFL South Africa, that the squad would consist of 25 players, 1 Umpire and 6 Team Officials. It is with a heavy heart on the sad news of the death of South African Simphiwe “Stone” Mbhalo that we offer our condolences to the family, friends and the AFL South Africa community. Details are scant but we believe he was shot and died aged just 24. In the international footy community he is best known for kicking the after the siren goal in the International Cup match against Ireland in 2008. For those unfamiliar with the moment the report of the match can be found here (and see the footage below). He kicked two goals in that match and was named in the best players four times in the IC08 tournament. The 19 year old Kenyan born Sudanese youth drafted by the Sydney Swans last night may need to have a globe (or perhaps Google Earth) handy when he tells his grandchildren his life story. He was born in Kenya (1994) in a refugee camp after his family fled war ravaged Sudan. The family came to Australia in 2003. We first heard of Aliir Aliir in 2010 when he was selected in the World XVIII team - he was living in Queensland and was identified as a talented footy youngster with a good leap and great skills. He was regularly found on the lists of goal kickers and best players in junior footy for Apsley Hornets in Qld. Flying Boomerangs, a documentary on the Flying Boomerangs’ tour to South Africa earlier this year, will air on National Indigenous Television (NITV - a relatively new digital free to air station on Australian TV), Thursday, November 7 at 9pm. The Flying Boomerangs is a personal development and leadership program for Aboriginal and Torres Strait Islander young men aged 14 -15 years-old, supported by the Coles AFL Indigenous Program. 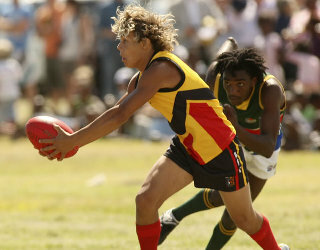 NITV accompanied the Flying Boomerangs to South Africa in January this year where the squad of 25 played two matches against South African teams in Potchefstroom and Durban, coached by former St Kilda player Raphael Clarke. Susan Chuot is the first African player to make the Western Australia state women’s team. She was originally born in South Sudan but her family soon moved to Kenya to escape the war. After her family moved to Australia, Chuot first played Australian Football at school, but her main passion was always soccer until she got involved at the Edmund Rice Centre, for young people of culturally and linguistically diverse backgrounds, coaching their Indigenous soccer team. Chout was then invited to become the first female to play for the Lions, the boys’ football team, in 2011 and she even captained the team in 2012. On February 1st the Flying Boomerangs made it a clean sweep, defeating the Geminder Youth Academy South Africa Lions 117 to 32 in game two of their tour of South Africa. Footage below from NITV and Australian TV broadcaster SBS. Footage from Australian TV station NITV covering Game 1 between the South African Lions and the Flying Boomerangs played in Potchefstroom last month. Sudanese born Majak Daw speaks about the preseason how he sees his season ahead. 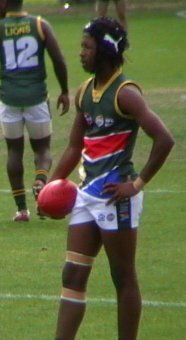 The AFL Indigenous Youth Squad, the Flying Boomerangs, has crushed the AFL South Africa Geminder Youth Academy Under 18 side, 125 to 14, at Mohadin Cricket Ground, Potchefstroom, in North West Province. Note that there appears to be some differences in the behinds and thus total points tally reported in various media, showing the Boomerangs 19.18 (132). The Flying Boomerangs team were featured on NITV news late last week. The video taken before their departure for South Africa can be seen below.